To help you clean the windows of your vehicle after washing, and to wipe down your car or truck, ask for our special Towel, available in our Free Towel Exchange Program. You buy into the program just once ($3.00) and receive a fresh towel. 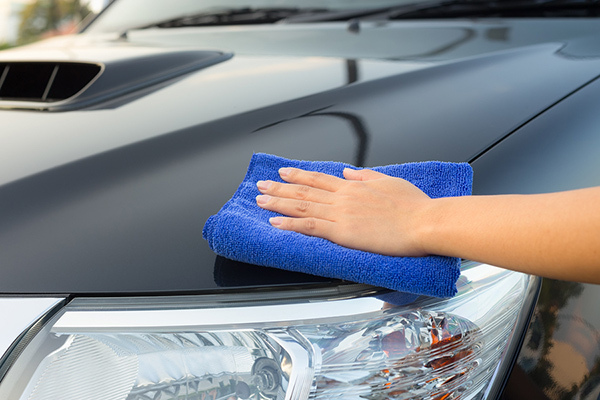 Every time you wash your vehicle thereafter, you exchange your towel for another fresh one with no additional charge. Each Towel is pre-conditioned with hot Glass® Window Cleaner in the towel, enabling you to clean and polish the windows first, and then to wipe off your car for a special shine and luster. Take the towel home with you after using, and each time you wash your care here, we will provide you with a clean pre-conditioned towel in exchange for your soiled one each time you return to wash your vehicle here, at no additional charge. We are dedicated to offering you the best and unique service, and thank you again for your patronage. *not to be used on cleaning wheels or areas with heavy grease that may ruin the towel’s future use. For the windows and the vehicles finish only.